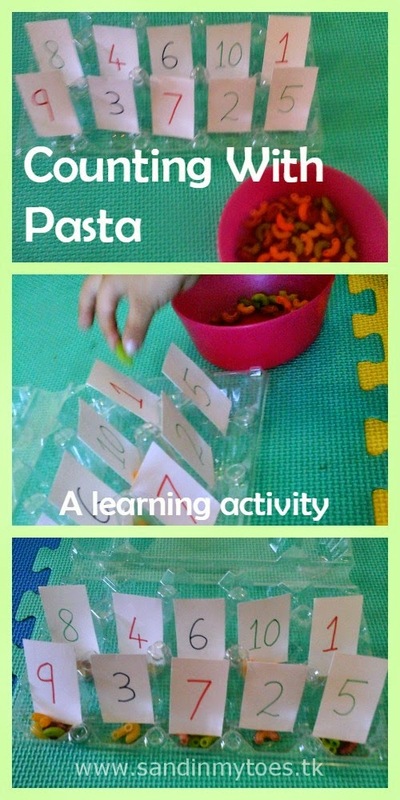 With numbers and letters, reinforcement and practice are important for children. But I like the challenge of coming up with something new each time I want Little Dude to recall what he knows. 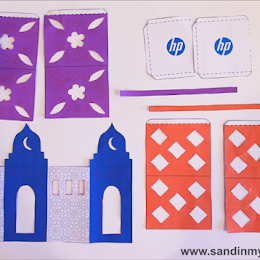 The good thing about learning through play is that you don't need too many tools to teach. Look around you, and you are bound to come across something that can make the process fun. 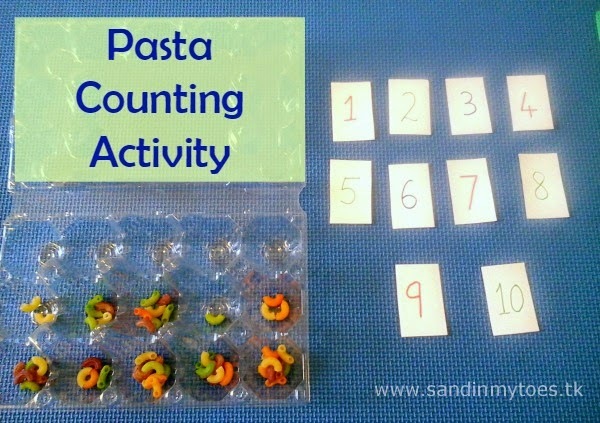 This Pasta Counting Activity required little effort, and was great for practising counting. You can replace the pasta with beans or pom poms, or whatever you have in hand. A word of caution here - don't leave young children unattended with small materials. You never know when they'll try to put something in their mouth. First method - I counted the pasta and put it in ten slots in the egg carton. These were in groups from one to ten, placed randomly. 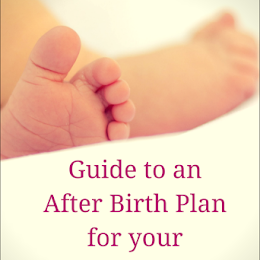 You can also place them in the right order, depending on your child's readiness. I made the number cards with white card stock and wrote on them with coloured felt pens. 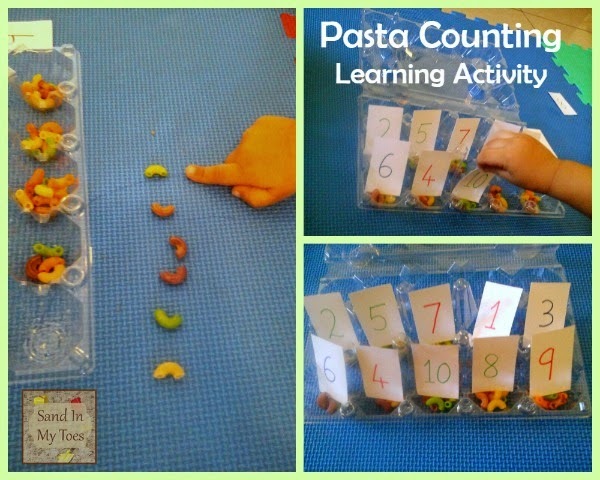 You don't have to use coloured pasta, but they also also be extended to do a colour sorting activity later. I asked Little Dude to pick the pasta one at a time from each slot, and line them up to count them. 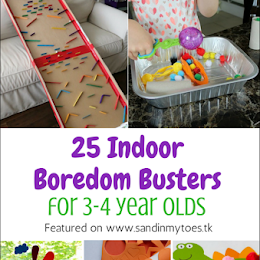 This can be a little tricky for toddlers, so let them do it at their own pace. Lining them up really makes the pasta easy to count. Once he had counted the number of pasta in each slot, I asked him to pick the corresponding number card and place it in that container. The photo below shows how the activity looked in progress, and when completed. Second method - After we had done this activity once, we did the reverse. I placed the cards in the slots first and asked Little Dude to count that many pasta pieces and put them in the right slot. 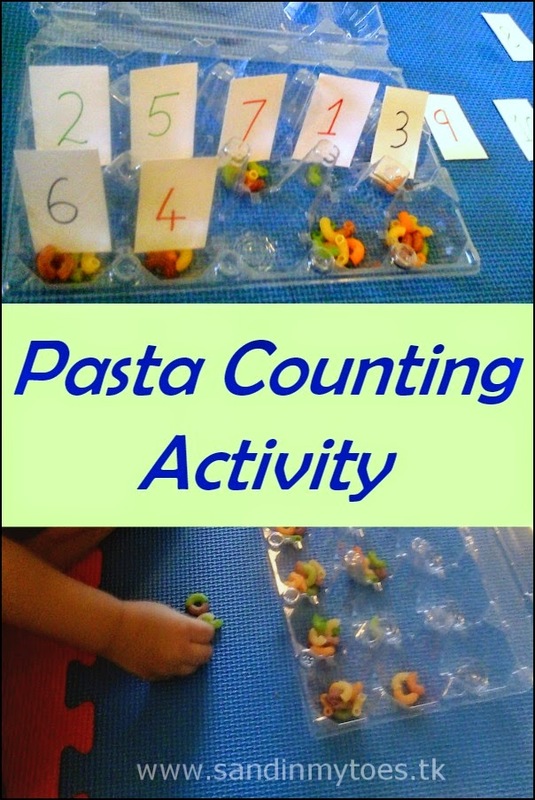 It was fun both ways, and really helped in practising those counting skills. 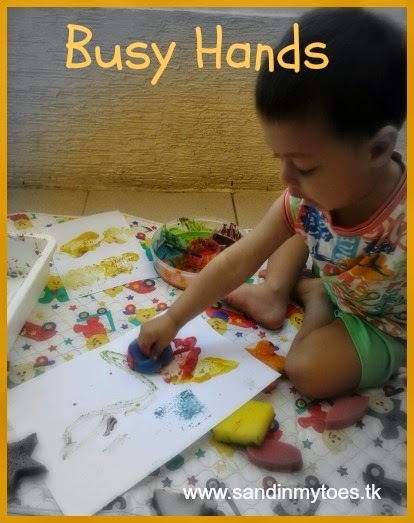 This would also make a good after-school activity for preschoolers and kindergartners to do. To see more ideas on simple learning, check out this post on Eleven Ideas For Everyday Learning. Great idea for fun learning. I like the way you used coloured pasta, more inviting for kids. Thank you for your kind compliment! This really makes my day. Thank you Karen, we always have some coloured pasta lying about! This would be a good activity to try, I hope he likes it! He loved doing it, and I prefer activities that are easy to set up! I hope she has fun doing it! I have to try making colored pasta again. Yes, it's always a good thing to have! Great tip, Mike! I'm going to edit the post and add that point.